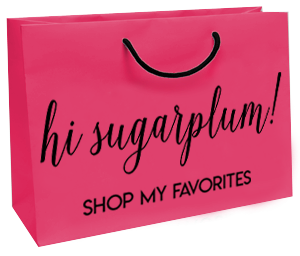 Summer of Style | 08 | hi Sugarplum! As it turns out, Mr. SP and I quite enjoy an empty nest! We’re going out two nights in a row, and staying up waaaaay past our bedtime. Thursday is Parent Night, and the kids return home from camp Friday morning, so we’re living it up while we can! 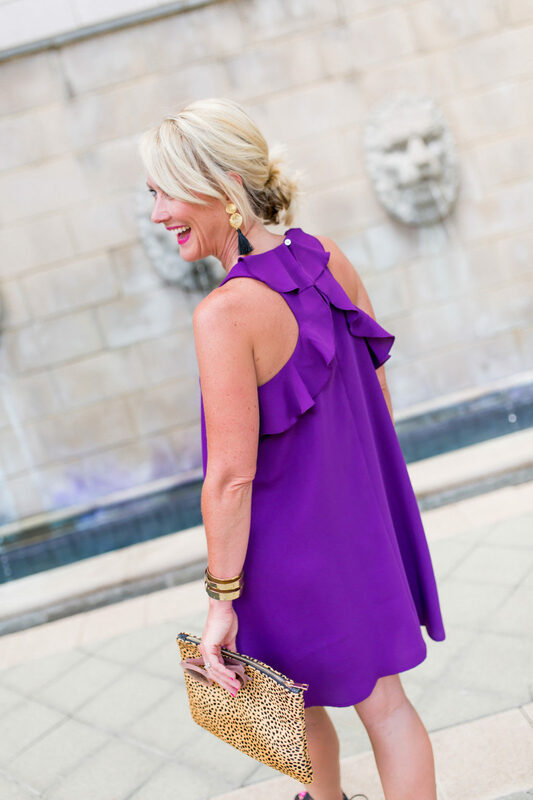 So it seemed fitting for today’s Summer of Style, a weekly series sharing simple outfits for all your Summer occasions, that I style this fun and flirty swing dress for Date Night. Swing dresses are favorites of mine for both day and evening wear…especially when serious eating is in the plans! I love that I can wear them with wedges, flat sandals, heels, and even flip flops, making it one of the most versatile dresses in my closet. I’ve worn it with neutral heels and jewels for dinner out in New York, and with a jean jacket and these sandals for daytime. Sometimes I go with a statement earring, others I add a bold necklace. 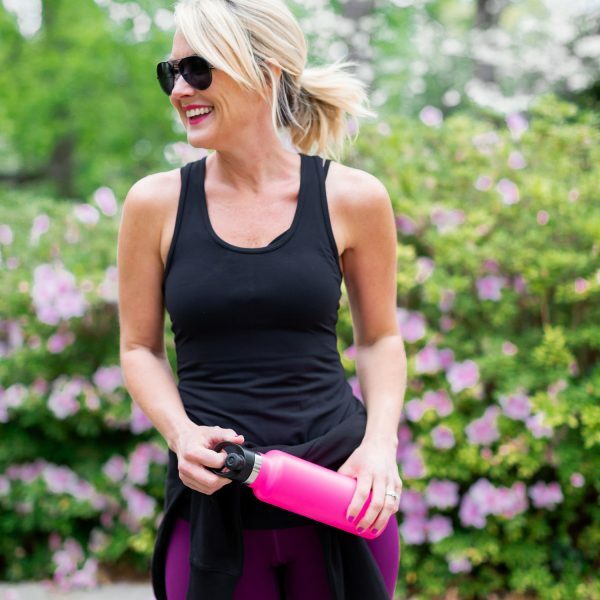 Fit Tip: I sized down to an XXS, but the XS fit, as well. I tried the petite, but it was just a tad short for my comfort zone (I’m 5’4″). My hair’s not long, but I still like to wear it up to show off the fun back. I usually go with a messy knot to off-set the sweetness of the ruffles. This gold cuff has made countless appearances over the years…it’s lightweight and adds the perfect amount of edge to my evening outfits. Interestingly enough, the color is what most people compliment when it comes to this dress. It’s just so unexpected, but not startlingly bold. And since it’s in the blue family, it has lots of styling options for pairing with other colors. Do you look for special details, like a racerback or ruffles, when it comes to choosing dresses? Are you a fan of the figure-forgiving swing shape, too? #whatfoodbaby See more Summer of Style inspiration here, and more Date Night styles here. I like that the dress is loose-fitting. Very suitable for those summer nights! Such a pretty dress! I shy away from purple but really need to step out of my comfort zone and try more colors! I love figuring flattering dresses! 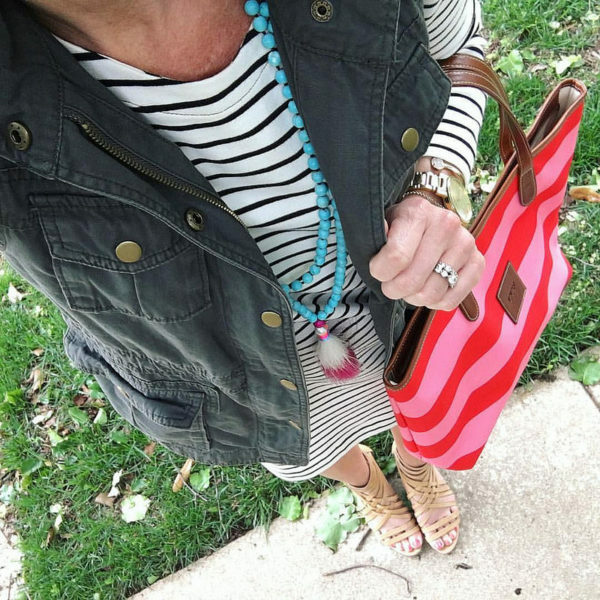 I LOVE this dress but sadly it does not look as cute on my 5’11” body… So just a tip for the tall ladies, it almost looks more like a tunic/tent than on the more petite ladies! So cute on you!! I’ll look into that cute leopard clutch. It would be perfect with a black tassel… And a reasonable price point too! Love it! I love me some subtle detailing and that dress is perfect! The leopard clutch gives me 😍…I may have to add it to my collection. The alternate one you linked is super cute but alas, sold out! That dress is darling on you; it’d be perfect for my cruise in September, but not sure that color has been cleared for redheads!! I think it would be stunning on a redhead! have a great trip! Love this dress on you! 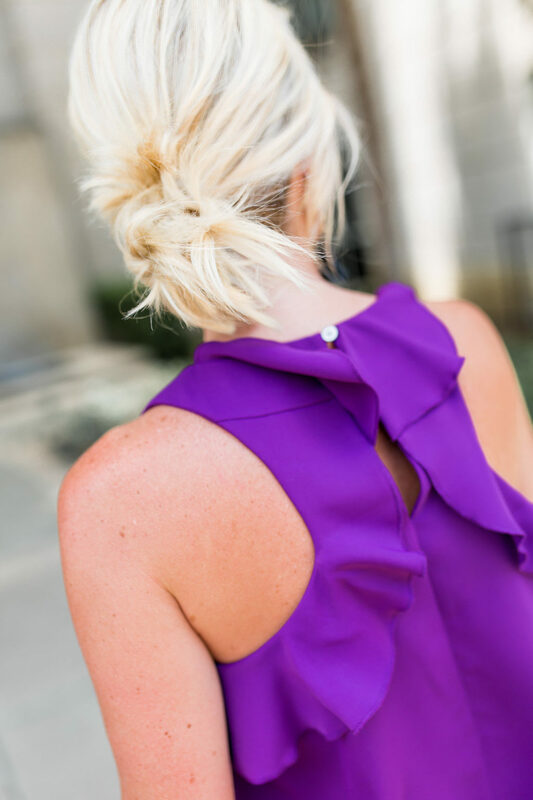 The ruffled racer back is so cute and these photos are so fun! Love how you’ve styled the dress with strappy sandals and a leopard clutch. I bought a blouse recently with the exact same neckline and ruffled back. I love it!! I just started my own blog! As always, you again is rocking this outfit and the accessories. I also love your hairstyle, which exposes the back of your beautiful dress. Thanks! I just purchased this dress because it looks so amazing on you. 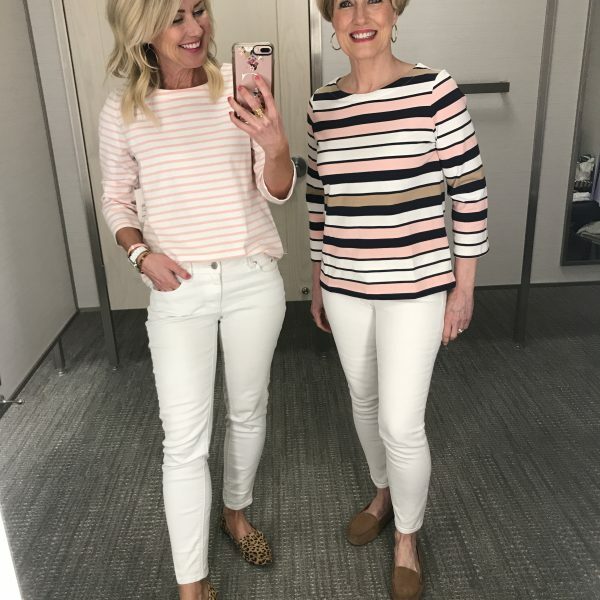 I have to ask – how do you keep it from wrinkling!? I washed and dried it to get rid of the “shipping” wrinkles. But now – it’s crazy wrinkled hanging in the closet. Do I need a steamer? I have a small hand-held steamer and it’s great for dresses, etc!